A cross section of Irish seed cake from "The Art of Irish Cooking" by Monica Sheridan, published in 1965. If you lived in Ireland in the 1960s and had an interest in food, you surely turned the channel to see Monica Sheridan in her element. As someone once wrote, this chef of the airwaves was the Nigella Lawson of her day, right down to licking her fingers on live television, which shocked many viewers. Sheridan, who died in 1998, had a huge following, and many fans looked up to her as a local girl made good (one of a farmer’s 14 children, she ended up marrying a wealthy barrister). And no fancy recipes for her—Sheridan’s specialty was traditional Irish cookery, pure and simple, and one of the recipes in her cheerful book The Art of Irish Cooking (Gramercy, 1965) is a seed cake doused with Irish whiskey. I have no idea whether she would have approved of our using Jim Beam Straight Kentucky Bourbon instead of Irish whiskey—it was the only liquor we had that came close—but the seed cake that resulted was strangely delicate, even ladylike. Presumably this is because Sheridan specified using cake flour instead of regular white flour. Also she limited the caraway seeds to just over a teaspoonful; other traditional recipes use many more seeds, so the flavour can be somewhat aggressive. 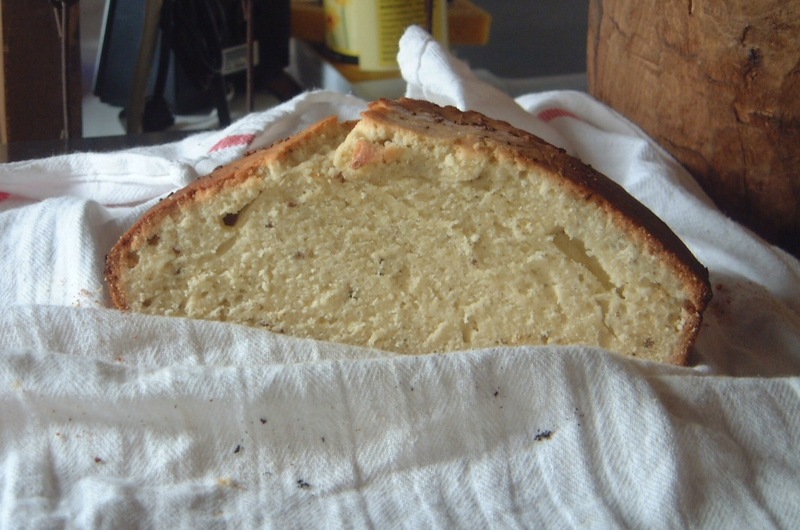 Monica Sheridan's Irish seed cake, straight from the oven. Cream the butter and the sugar together until white and fluffy. Add the eggs, one at a time, with a dust of flour. Beat well after the addition of each egg. Sift the flour with the baking powder and fold gently into the egg mixture with the caraway seeds. Add the whiskey and pour the mixture into an 8-inch cake pan that has been lined with wax paper. 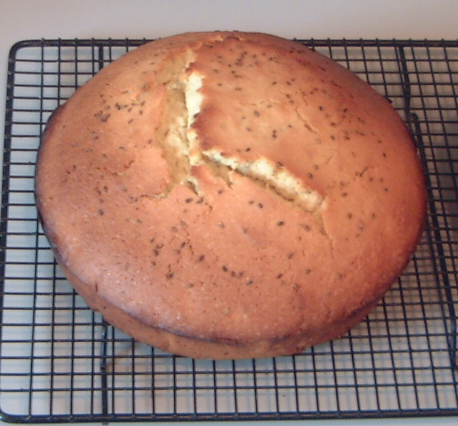 Scatter some caraway seeds on top. Bake for 1 hour. Reduce the heat toward the end of the baking time. British actress Joan Greenwood as seed-cake-loving aristocrat Lady Selina Hazy in the 1987 television production of "Miss Marple: At Bertram's Hotel." “Is it real seed cake?” With her hallmark opulent enunciation and husky tones, British actress Joan Greenwood delivered that line in the 1987 television adaptation of Agatha Christie’s novel At Bertram’s Hotel. Portraying Lady Selina Hazy, she and the mystery’s sleuth, Miss Jane Marple (portrayed by the divine Joan Hickson), are sitting in said London hotel, and the waiter has suggested the childhood friends try one of its old-time specialties—seed cake, a pound-cake-like treat packed with caraway seeds that give it a light licorice-style flavour. Apparently Lady Selina’s elaborate concern about the hotel’s culinary productions was genuine. Seed cake is a British tradition that has fallen by the wayside, and it apparently was in danger of dying out even in Agatha Christie’s day. British cookery writer Arabella Boxer has described seed cake as “an English phenomenon: enormously popular with some, but anathema to others .… I find it delicious in a somewhat austere way.” American food expert James Beard, for his part, called it “quite addictive.” As far as I am concerned, few things are more delicious in the morning or afternoon than a slice of seed cake accompanied by a hot cup of tea or a glass of port. Given our family’s passion for Agatha Christie dramatizations—seed cake shows up in several of her novels—my husband and I decided to research and make five seed-cake recipes, ranging from the mid 19th century to the 1990s, all slightly but distinctively different. We hope you enjoy them as much as we have and will be posting them all over the next few days. REVIEW: Bold anise-like flavour, a bit dry yet fabulous at breakfast with a swipe of sweet butter. Beat the butter to a cream, sift the sugar onto it, and cream both together. [Or blend in the food processor.] Beat in one egg, and a little of the flour, then the second egg and more flour. When all the eggs and flour are in, add the caraway seeds and orange rind. [If making for the first time, try 1/2 tablespoon seeds, but if you are fond of seed cake use 1 tablespoon.] Beat all together for about 10 minutes, lifting the mixture up to make it as light as possible. [Or continue to blend in the processor.] Pour the mixture into a [well-buttered and] paper-lined tin [I used a loaf tin holding 1-1/2 pints]. Bake [for 1 and 1/2 hours]. 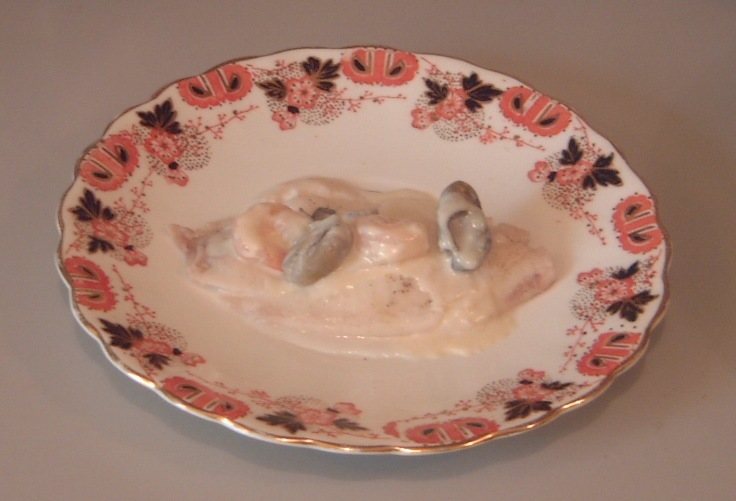 Sole de la Maison, a recipe from "The Alice B. Toklas Cook Book" (Anchor, 1960). Though the hotel escaped mention in The Alice B. Toklas Cook Book (Anchor, 1960), its food-conscious author was admiring of the hotel’s widely admired menu, especially Sole de la Maison, or sole, house style. The dish Toklas remembered is a curious but memorable one celebrating the glories of the sea—a milk-white filet of sole decorated with oysters and shrimp and enrobed in a cream sauce spiked with sherry. I made it, and it looked as elegant as it tasted—even if I was forced to use tilapia, because the grocer was all out of sole. Once I can figure out whom to invite and impress, we’ll be serving it again. Place the filets in a large skillet with enough milk to cover them; add salt and pepper. Cover and simmer gently over a low flame for 15 minutes, depending on the thickness of the filets. Drain thoroughly. Place on a preheated carving dish and keep hot. Poach in the leftover milk, only long enough to heat, the oysters and the shrimps. Place them alternately on the filets, so that each filet has two oysters and two shrimps. Cover with several spoonsful of heavy cream sauce made with heavy cream, [a sprinkling or two of flour], and flavoured with 2 tablespoons dry sherry. 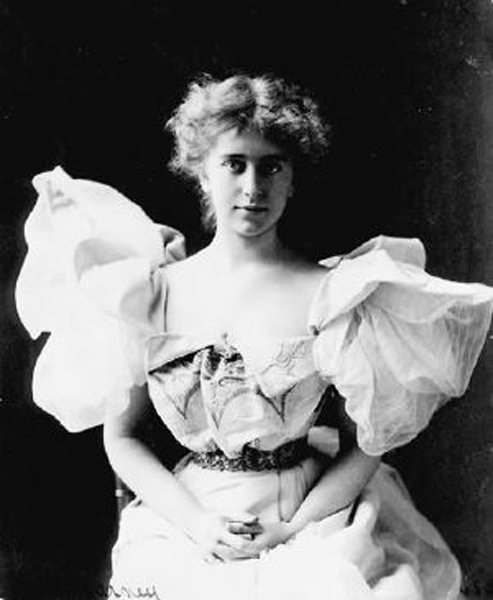 Natalie Clifford Barney, American heiress and lesbian extraordinaire, circa 1900. When I lived in Washington, D. C., some 20 years ago, I used to frequently visit The Alice Pike Barney Studio House, a curious stucco-clad museum on Massachusetts Avenue. The Spanish Revival Style townhouse had been the home of a somewhat racy hostess and artist who surrounded herself with painters, sculptors, and the like, many of whom were likely most attracted by her millions. Some of the money came from her whiskey-distiller father and the rest via her late husband, a railway-car manufacturer. Though largely forgotten today—the house-museum, an extraordinary place, was cruelly sold to Latvia, which now uses it as its embassy—the eminent Mrs. Barney was a major mover and shaker in the Washington art world and deserves to be more admired than she is. But that civic reputation pales beside her position as the mother of Natalie Clifford Barney (1876-1972), a dashing lesbian poet and playwright who cut a wide swath in European literary circles and left dozens of broken hearts in her considerable amatory wake. Known as the Amazon for her blonde beauty, Barney lived glamorously, wrote flamboyantly, and romanced women in a manner than can only be called swashbuckling, from painter Romaine Brooks to literary niece Dolly Wilde. (Her mother, predictably enough, was horrified, and was scandalized by her daughter’s Sapphic poetry.) She and Alice B. Toklas were good friends, and when time came for Toklas to publish her famous cookery book, she included a few of Barney’s spécialités de la maison. 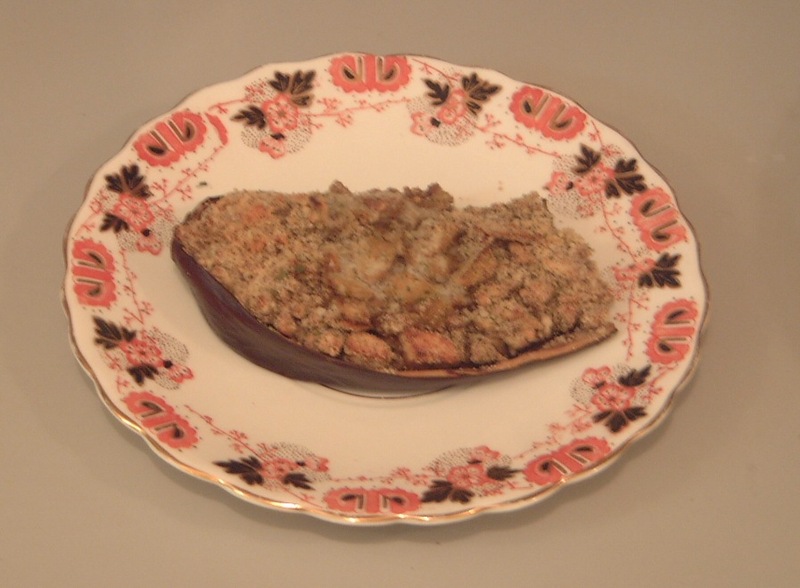 I tried one of them recently, a side dish called Stuffed Egg Plant with Sugar. This is one of my favourite vegetables, and the directions looked absolutely unchallenging. I was a bit wrong on that score. Have you ever tried to scoop out the insides of an eggplant without damaging the lustrous purple skin? It is not particularly easy. Once that is completed, however, the rest is smooth sailing, culinarily speaking. The only thing I would change about the recipe is to (a) toss the mixture of eggplant and breadcrumbs with a bit of olive oil to moisten it before baking and/or (b) to evenly distribute the butter across the entire surface of the eggplant-and-breadcrumb mixture rather than plopping it in the center as directed. As for the sugar, it adds a pleasant sweetness. Divide the egg plants in half lengthwise. Remove the pulp, chop, [place in a large mixing bowl], add breadcrumbs, sugar, salt, and pepper. Stuff the four halves very abundantly [and place on a cookie sheet]. On each half place a piece of butter the size of a large walnut and 1 tablespoon of water and cook in a moderate oven [350 degrees Fahrenheit] for 1/2 hour [or until golden brown on top]. 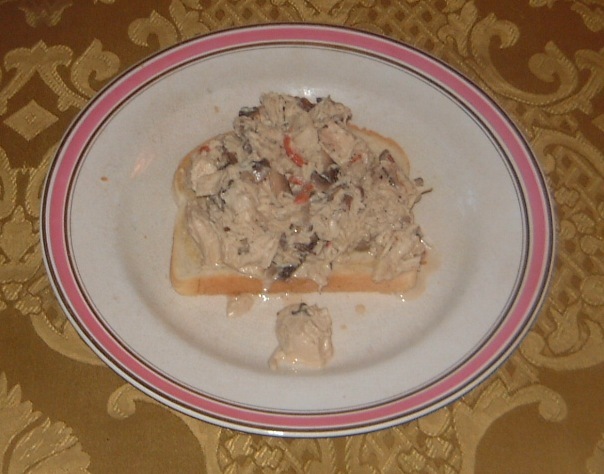 Salmon Tatanoff, a specialty of Princess Andrew of Russia. The salmon is absolutely simple to prepare, it being wrapped in well-buttered parchment paper—en papillote, for the technically minded among you—and baked for about an hour. The sauce was easy too but a bit alarming when completed. Caviar of an unspecified hue was called for, so I cheaply opted for red lumpfish, thinking it sounded suitably Russian in color. Alas, the sauce it made was a brilliant shade of coral, though the gray alternative that would result from non-red fish eggs seemed about as appetizing. 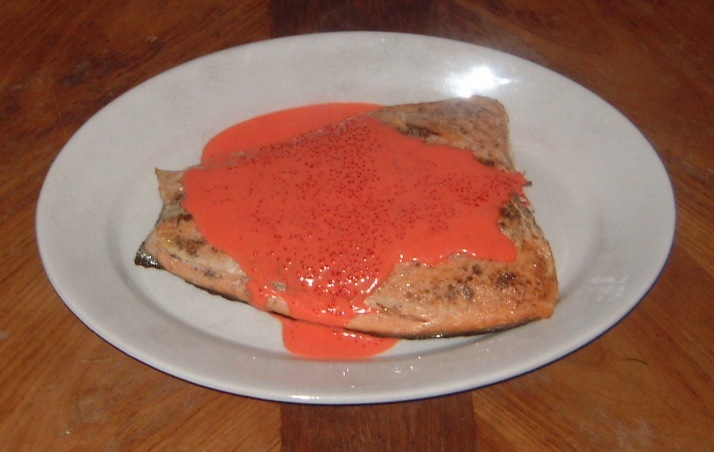 That being said, I would serve Salmon Tatanoff again—though I’ll give the darker sauce a try. Perhaps it looks very chic. Frankly the red one looked a bit aprés homicide. Our daughter, however, adored it, saying upon its presentation, “It’s pink, so you know I’ll love it.” And so she did. Remove the fish’s skin, salt and pepper the salmon all over, and wrap in parchment paper, well oiled or buttered. [NOTE: I didn’t remove the salmon skin; it was just too difficult, and I am far too impatient.] Put this carefully folded like a neat parcel in a buttered fireproof dish, and bake in a very moderate oven [about 320 degrees Fahrenheit] for about an hour to 1-1/2 hours. Serve with caviar sauce (recipe below). In the top of a double boiler put the egg yolk, a few drops of cold water, lemon juice, 1 ounce of butter, salt, and pepper. Cook over boiling water, stirring continuously. First the butter melts, then the yolk thickens, and you add more and more butter until you have the sauce the right consistency which should be rather stiff. If it curdles due to too much heat, add a few more drops of cold water and whip vigorously. Then add a small quantity of whipped cream and caviar. Stir well and serve. A bit messily presented: Chicken à la King from "Elsie de Wolfe's Recipes for Successful Dining" (1934). Anyone who reads this blog knows I have a weakness for creamy foods. There just something about the texture of a recipe incorporating butter and cream that is terrifically fulfilling, both emotionally and gustatorially—the richness, the aroma, the calories. Since my family doesn’t devour such ingredients every day, I don’t mind serving one extravagant dish a week. Last night it was Chicken à la King from Elsie de Wolfe’s Recipes for Successful Dining (1934). The origins of this dish are obscure, and numerous stories about its invention abound. Some sources date the creation of this chicken, cream, and sherry concoction to the 1880s or 1890s, either at Claridge’s in London or Delmonico’s in New York City, where it was reportedly known as Chicken à la Keene, after its honoree, a wealthy American. One site states the likeliest genesis story is that it was invented around 1900 at the Brighton Beach Hotel at Brighton Beach, Long Island, New York, and named for the hotel’s owner, E. Clark King (the original recipe from that source is published here, right below de Wolfe’s version). Yet another source, a 1912 advertisement in Good Housekeeping magazine for Purity Cross canned chicken à la king, gives credit to the chef at the Ritz in Paris, who reportedly prepared it for Edward VII of Great Britain, using the monarch’s own recipe. Whatever the truth, as Calvin Trillin once noted, chicken à la king (or Keene) was eaten a lot by “rich people of the sort who were listed in the social register.” Good Housekeeping, in 1916, called it “a very aristocratic and delectable supper dish.” It didn’t take long, however, for it to become a staple at women’s clubs, mess halls, and board luncheons all across the United States. And for good reason—it’s simple to prepare, is a great use of leftover chicken or turkey, and is one of the world’s finest comfort foods. Somewhere along the way cayenne pepper crept into the ingredients, though usually specified as “a few grains,” which really doesn’t do much. I gave Elsie de Wolfe’s Chicken à la King recipe a couple of healthy shakes of cayenne pepper, which gave it a welcome kick that was deemed acceptable by all, even our usually spice-averse daughter. I did not, however, garnish it with sliced truffles. Alas, I was fresh out of that particular fungi. Slice the mushrooms and pimento into thin, long strips. Place in sauce-pan with butter. Cover the pan and cook over a low flame for 5 minutes. Add the chicken, sherry, and 1/2 pint of cream. Cook for 5 more minutes. Mix the yolk with the 2 teaspoons cream and add at the last moment of cooking, stirring it in thoroughly. Do not allow the mixture to boil after the egg has been added. Remove from heat, season with salt, pepper, and cayenne to taste, and serve over slices of hot buttered toast. SOURCE: The New York Times, 14 April 1980, an article by Craig Claiborne citing a circa-1900 brochure from the Brighton Beach Hotel. Patience Gray, co-author of "Plats du Jour, or Foreign Food," a cookery book that was all the rage in postwar England and which put this bohemian lady on the international culinary map. In 1957 Patience Gray and her friend Primrose Boyd wrote Plats du Jour, or Foreign Food (Penguin Books), a cookery book of Continental recipes published in the wake of Mediterranean Food (1950) by culinary high priestess Elizabeth David. The point of Plats du Jour, the authors wrote in its introduction, was to compile a series of “dishes which can be served with no further sequel than salad, cheese, and fruit.” In other words, simple toothsome fare, much of it French and Italian in origin, that harried women and men could prepare without a lot of fuss and bother. It was a roaring success, so much so that Plats du Jour reportedly sold more than 50,000 copies in just 10 months and established itself as “the height of chic and sophistication,” according to an article in The Independent. The book looked delicious as well, due to its bold pink cover and sprightly illustrations by a young artist named David Gentleman, today famed as a designer of postage stamps. So just who were the mesdames Gray and Boyd? 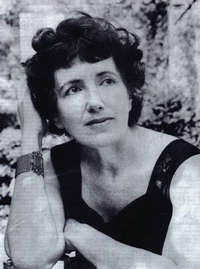 As the website of Persephone Books explains, the elegant brunette Gray (1917-2005) could be described as somewhat racy, at least by the standards of the day, an army officer’s daughter who bore two children out of wedlock, though she eventually married Belgian sculptor Norman Mommens “despite her principled objections to the institution,” as Gray’s obituary archly stated. Her literary partner Boyd (1913-1982) was a painter and wife of a BBC producer, and their first project was a translation of the classic Larousse Gastronomique. We’re working within a strict budget now at home, thanks to the dismal economy and bills that must be paid, so when I alighted upon a Plats du Jour recipe for a Spanish dish called merluza al horno—basically baked haddock—I jumped at the opportunity to try it. Haddock is quite inexpensive and, luckily, our local Price Chopper had it in abundance. I’m sorry I don’t have a photograph of it; we ate it too quickly. Trust me though; it was marvelous. Either fresh or dried haddock is used for this dish which can be prepared and cooked in a very short space of time. Cut the fish into pieces of the right size for serving and put them in a fireproof dish into which 1 tablespoon of the olive oil has been poured. Then sprinkle the white wine over the fish, put the tomatoe purée over it next, then the garlic, [the remaining tablespoon of olive oil], then some freshly ground black pepper, and, finally, the parsley and bread crumbs distributed evenly over all. Put the dish into the oven and let the fish cook for 20 to 25 minutes depending on the size of the pieces. When the fish is ready, serve it from the fireproof dish with some crusty bread and fresh butter.